I have a new interest or obsession, I’m not quite sure in which category it falls. But I have been quietly perusing the internet for botanical illustrations. As I am sure you can guess, getting my hands on an original is neigh impossible and would probably require me selling something and I can tell you now that’s not going to happen. But it hasn’t stopped me looking for runners up. This interest was sparked by my recent poster purchases. I decided that the interior walls of our house needed a little bit more lovin’ than we have previously shown them, plus adorned walls make a house feel like a home, all warm, cozy and inviting. But rather than take the obvious and sensible route of enlarging and framing much loved travel, wedding, my life, his life, our life photographs I bought posters and paid a visit to the much sort after Scandinavian (you want it they’ve got it) store for the frames – perfect! The Rose Of A Hundred Petals. Don’t you just love the visiting butterfly. Tulip with text, so gorgeous. I love my new posters and framing choice, they contribute character to our walls and to be honest I think myself quite clever for the interior decorating – just saying! But back to the illustrations. 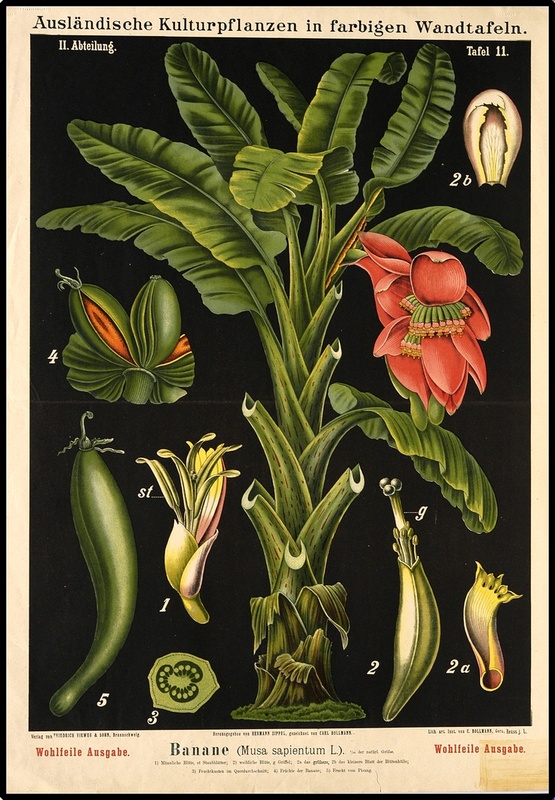 Historically, Botanical Illustrations were used to document newly discovered plant species and would generally comprise of the plants defining features, for example; flower,inflorescence, fruit, leaves. They were beautiful drawings, highlighting the intricate details of plants and providing a source of identification for both Botanist and the amateur plant lover. The first recorded Botanical Illustrations were a collection of herbal plants contained in the Codex Vindobonensis or Juliana Anicia Codex dated at about 512AD. It was created for imperial Princess Juliana Anicia and now resides in the Österreichische Nationalbibliothek in Vienna Austria – Oh, another reason for travel! Musa sapientum. It’s not as dainty as some of the others but I do love the drama of the black background. The Codex Vindobonensis includes 383 botanical illustrations as well as sections on fishing and bird catching. The illustrations, generally speaking, were most likely completed by a selection of different artists with ranging skill levels. Whatever the skill level of those artists that completed older illustrations I think they are beautiful, fabulous and extraordinary all rolled into one. A display of various Fern leafs. Love greenery. I have a soft spot for Australian natives so please excuse me while I indulge! I know you’ll love these too. I have selected a number of illustrations that I particularly like and hope you do too. I like them for their quality, botanical detail, colour or the species depicted. I must say I would enjoy a section of wall in my house to be dedicated to the art of botanical illustration. But the search goes on, where should I start?